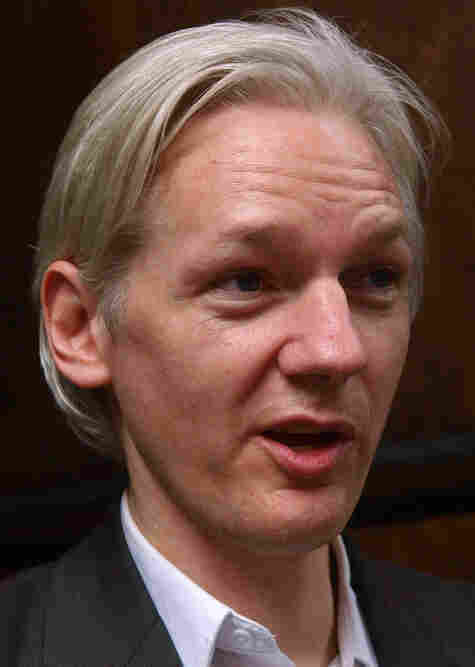 WikiLeaks' Julian Assange Dismisses Leak Critics : The Two-Way In NPR interview, WikiLeaks Julian Assange dismissed those who say Afghan leaks are old news. More than a few critics of WikiLeaks' unauthorized release of 90,000 classified U.S. documents related to the Afghanistan War have said, among other things, the documents contain precious little that we didn't already know. Indeed, that was a commentary offered by President Barack Obama in his first public statement about the leak. But WikiLeaks founder Julian Assange, the founder of WikiLeaks, speaking with Robert Siegel, co-host of NPR's All Things Considered, dismissed those critics. Indeed, he accused the Washington Post of sour grapes in its criticism. ROBERT: First, I'd like to put to you what a Washington Post editorial said this week about the WikiLeaks Afghan war diary. It said "It hardly merits the hype offered by the web site's founder", you, to quote, and I'm quoting again "because while it is voluminous, the WikiLeaks material tends to fill out and confirm the narrative of Afghanistan between 2004 and 2009 that most Americans are already familiar with." Is that a fair appraisal? ASSANGE: Not really. I mean we in journalistic collaboration with the New York Times, Der Spiegel, and the Guardian and us worked on this material. I assume a Washington Post bias simply because they didn't have access to the great big scoop. This material is a compendium of information from the last six years of the war in Afghanistan is reporting from the field on every attack counterattack... U.S. troops killed, civilians killed, with some exceptions, were top secret missions, and CIA. So, has the Washington Post read all 91,000 reports? Of course not. This is such a tremendous historical archive that the full story is only going to emerge over the coming weeks as that material is correlated to the witness who are on the ground both U.S. soldiers and Afghani. Assange has likened the importance of the leaked the documents to that of the Pentagon Papers famously leaked by Daniel Ellsberg, a leak that only amplified questions about official U.S. policy during Vietnam. Robert asked Assange about this, pointing out a weakness in the comparison. Assange seemed to argue that the raw intelligence reports that make up the latest leak are even more valuable, in their own way, than the Pentagon Papers. ROBERT: You've compared this to the leak of the Pentagon Papers. In that case, what was leaked was an edited analysis that had been done for the Pentagon that documented, for example, how the president of the U.S. had decided to expand a war while publicly promising the contrary. These are raw reports that were not confirmed and edited. They don't seem to demonstrate anything as dramatic as the lies of Lyndon Johnson in those days. ASSANGE: Well, in that particular case you're referring to you're talking about a personality whose words can be quickly and easily grabbed onto. This material has its strengths in that it is not an analysis. It is not written at the higher levels so it can be publicly massaged. It is in fact, the raw facts of the war, the same facts being passed up the Pentagon chain of command that generals and policymakers are trying to make their decisions on. These raw facts can be interpreted by others who are trying to propose alternative policies, by academics, by journalists and by people concerned with the war directly, soldiers and the Afghanis. For those who haven't read it already, the New Yorker profiled the mysterious Assange recently. His background is unusual, to say the least. Assange’s mother believed that formal education would inculcate an unhealthy respect for authority in her children and dampen their will to learn. “I didn’t want their spirits broken,” she told me. In any event, the family had moved thirty-seven times by the time Assange was fourteen, making consistent education impossible. He was homeschooled, sometimes, and he took correspondence classes and studied informally with university professors. But mostly he read on his own, voraciously. He was drawn to science. “I spent a lot of time in libraries going from one thing to another, looking closely at the books I found in citations, and followed that trail,” he recalled. He absorbed a large vocabulary, but only later did he learn how to pronounce all the words that he learned.